Most people think about their waistlines, not their brains when they think about carbohydrates. Often, the mainstream media and food marketing have promoted the health benefits of whole grains, but in Grain Brain, renowned neurologist Dr. David Perlmutter shares compelling medical research about how the over-consumption of complex carbohydrates (whole grains), not just simple carbohydrates, can impact medical conditions such as dementia, ADHD, anxiety, chronic headaches, depression and more. On the upside, the doctor asserts that we can encourage the growth of new brain cells at any age through our diet and lifestyle choices. Making healthy choices may help to lessen or alleviate the affects of some medical conditions without the use of prescription drugs. In his 4-week plan, Perlmutter lays out the steps to straighten out a diet burdened with carbohydrates and fats. 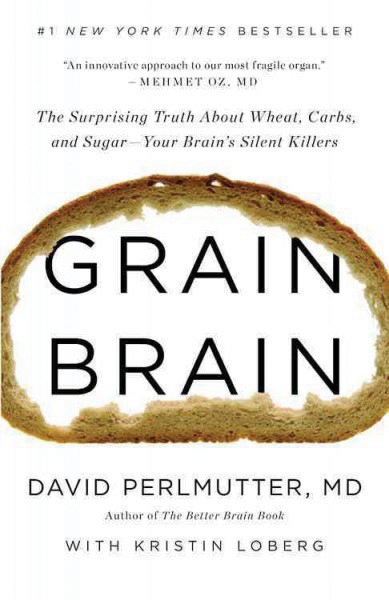 Coming this fall from David Perlmutter, is The Grain Brain Cookbook: More Than 150 Life-Changing Gluten Free Recipes to Transform Your Health, slated to be released September 9, 2014.